Achillea & Co is committed to providing a high quality legal service to all clients. When something goes wrong we need to know about it so we can put things right and improve our standards. If they believe it would be helpful contact you to try to arrange a meeting with you within 14 days to discuss your concerns and put forward a solution, and will write to you as soon as possible, and in any event within 3 working days of the meeting to confirm the outcome of that meeting and, if applicable, the solution agreed. If the proposed solution is not acceptable the complaints handler will review the matter and confirm the firms full and final position on your complaint within 14 days. If we are unable to satisfactorily resolve your complaint within 8 weeks you can ask the Legal Ombudsman to consider your complaint. The Legal Ombudsman can be contacted at PO Box 6806, Wolverhampton WV1 9WJ. It is made no later than 6 years from the date of the act or omission or 3 years from when the client should reasonably have known there was cause for complaint. trustees of trusts with an asset value of more than £1m. 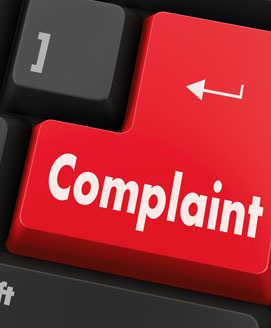 Subject to the above, complaints about poor service should be directed to the Legal Ombudsman. You should report a matter direct to the SRA if you think a firm or anyone regulated by the SRA has breached an SRA Principle. Details of the SRA Principles can be found at www.sra.or.uk/consumers. If we have to change any of the timescales set out in this procedure, we will let you know and explain the reasons for the change. The firm is bound by the rules of the SRA and is not entitled to charge for handling a complaint.